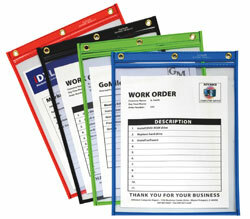 Store and protect work orders, production schedules, inventory cards and more in these stitched shop ticket holders. These sturdy holders last a long time! Store and protect work orders, production schedules, inventory cards and more in these C-Line stitched shop ticket holders. Strong, rigid, clear vinyl allows for easy visibility of documents. Convenient eyelet at top for hanging. Reinforced stitched edge for longer product life. 9 x 12. Both sides clear. Holders open on short side. 25/BX. Learn about the wide variety of shop ticket holders at C-Line.. Suggested Use: Store and protect work orders, production schedules, inventory cards, restaurant menus and more. I'm John at C-Line. And today we're going to talk about our 9 by 12 stitched shop ticket holders. Store and protect work orders, production schedules, inventory cards, restaurant menus, and more in C-Line's stitched shop ticket holders. These holders are manufactured from heavyweight rigid vinyl with taped and stitched edges to provide maximum durability for your documents. They store up to 9 by 12 inserts and are open on the short side. Clear on both sides, the holder has a met eyelet making it possible to hang and post information wherever you need it. The stitched shop ticket holders are perfect for manufacturing, auto repair, inventory control, office, retail, and shop environments. Really anywhere information has to be posted or readily available. Order yours now. That's all we have for today. I'm John at C-Line. Thanks for watching.